LeoStorage's features depend on its configuration. If once a LeoFS system is launched, you cannot modify the following LeoStorage's configurations because the algorithm of the data operation strictly adheres to the settings. obj_containers.path Modifiable with condition Able to change the directory of the container(s) but not able to add or remove the directory(s). You need to move the data files which are <obj_containers.path>/avs/object and <obj_containers.path>/avs/metadata, which adhere to this configuration. obj_containers.num_of_containers Yes Not able to change the configuration because LeoStorage cannot retrieve objects or metadatas. If you want to modify this setting in order to add additional disk volumes for LeoFS then follow the instruction here3. replication.rack_awareness.rack_id Yes Not able to change the configuration because LeoFS cannot retrieve objects or metadatas. queue_dir Modifiable with condition Able to change the MQ's directory but you need to move the MQ's data, which adhere to this configuration. If you want to modify settings like where to place leo_storage.conf, what user is starting a LeoStorage process and so on, refer For Administrators / Settings / Environment Configuration for more information. managers Name of LeoManager nodes. This configuration is necessary for communicating with LeoManager's master and LeoManager's slave. obj_containers.num_of_containers A number of object-containers of each directory. As backend_db.eleveldb.write_buf_size * obj_containers.num_of_containers memory can be consumed in total, take both into account to meet with your memory footprint requirements on LeoStorage. obj_containers.metadata_storage The metadata storage feature is pluggable which depends on bitcask and leveldb. object_storage.is_strict_check Enable strict check between checksum of a metadata and checksum of an object. watchdog.rex.is_enabled Enables or disables the rex-watchdog which monitors the memory usage of Erlang's RPC component. mq.backend_db The MQ storage feature is pluggable which depends on bitcask and leveldb. backend_db.eleveldb.write_buf_size Write Buffer Size. Larger values increase performance, especially during bulk loads. Up to two write buffers may be held in memory at the same time, so you may wish to adjust this parameter to control memory usage.Also, a larger write buffer will result in a longer recovery time the next time the database is opened. As backend_db.eleveldb.write_buf_size * obj_containers.num_of_containers memory can be consumed in total, take both into account to meet with your memory footprint requirements on LeoStorage. backend_db.eleveldb.max_open_files Max Open Files. Number of open files that can be used by the DB. You may need to increase this if your database has a large working set (budget one open file per 2MB of working set). backend_db.eleveldb.sst_block_size The size of a data block is controlled by the SST block size. The size represents a threshold, not a fixed count. Whenever a newly created block reaches this uncompressed size, leveldb considers it full and writes the block with its metadata to disk. The number of keys contained in the block depends upon the size of the values and keys. replication.recovery.size_of_stacked_objs Size of stacked objects. Objects are stacked to send as a bulked object to remote nodes. replication.recovery.stacking_timeout Stacking timeout. A bulked object are sent to a remote node after reaching the timeout. mdc_replication.size_of_stacked_objs Size of stacked objects. Objects are stacked to send as a bulked object to a remote cluster. mdc_replication.stacking_timeout Stacking timeout. A bulked object are sent to a remote cluster after reaching the timeout. queue_dir Directory of queue for monitoring "RING"
You can configure plural object containers with comma separated value of obj_containers.path and obj_containers.num_of_containers. Without setting object_storage.is_strict_check to true, there is a little possibility your data could be broken without any caution even if a LeoFS system is running on a filesystem like ZFS1 that protect both the metadata and the data blocks through the checksum when bugs of any unexpected or unknown software got AVS files broken. mq.num_of_mq_procs can affect not only the performance/load during recover/rebalance operations but the load while there is at least one node suspended/downed in the cluster. so that setting mq.num_of_mq_procs to an appropriate value based on the amount of expected traffic and hardware specs is really important. This section would give you the brief understanding on mq.num_of_mq_procs and how to choose the optimal value for your requirements. For more details, Please see Issue #9872. LeoStorage's MQ mechanism depends on the watchdog mechanism to reduce costs of a message consumption. 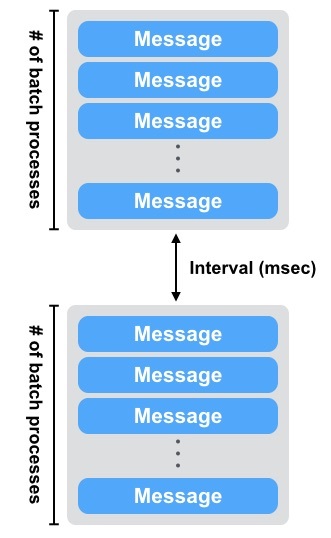 The MQ dynamically updates a number of batch processes and an interval of a message consumption. 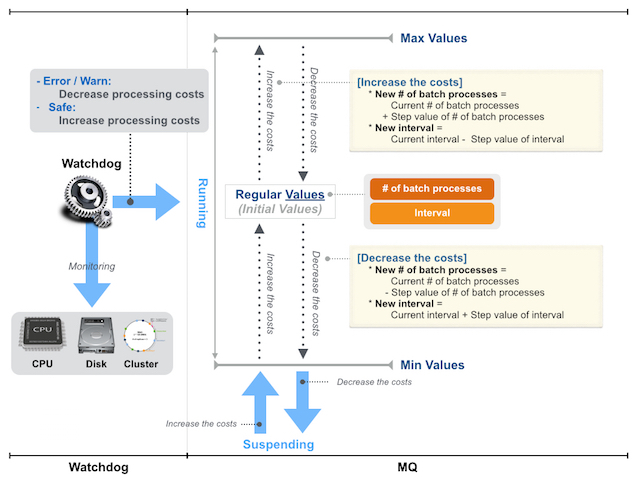 As of Figure: Relationship of Watchdog and MQ, the watchdog can automatically adjust a value of a number of batch processes between mq.num_of_batch_process_min and mq.num_of_batch_process_max, which is increased or decreased with mq.num_of_batch_process_step. 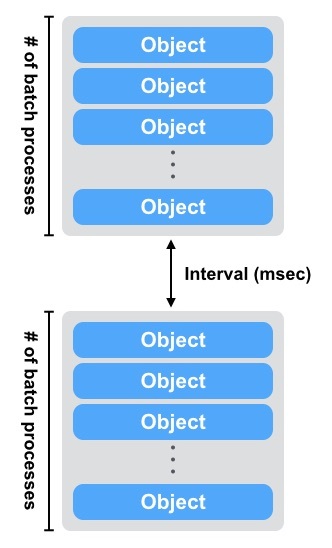 On the other hands, a value of an interval is adjusted between mq.interval_between_batch_procs_min and mq.interval_between_batch_procs_max, which is increased or decreased with mq.interval_between_batch_procs_step. When the each value reached the min value, the MQ changes the status to suspending, after that the node’s processing costs is changed to low, the MQ updates the status to running, again. LeoStorage's auto-compaction mechanism also depends on the watchdog mechanism to reduce costs of processing. The Auto-compaction can dynamically update a number of batch processes and an interval of a processing of seeking an object. The basic design of the relationship with the watchdog is similar to the MQ. As of Figure: Relationship of the watchdog and the auto-compaction, the watchdog automatically adjusts the value of a number of batch processes between compaction.batch_procs_min and compaction.batch_procs_max, which is increased or decreased with compaction.batch_procs_step. On the other hand, the value of an interval is adjusted between compaction.waiting_time_min and compaction.waiting_time_max, which is increased or decreased with compaction.waiting_time_step. When the each value reached the min value, the auto-compaction changes the status to suspending, after that the node’s processing costs is changed to low, the auto-compaction updates the status to running, again.